Interracial Dating Central is our #4 choice among the niche dating sites for those interested in making contacts with members from other countries and races. 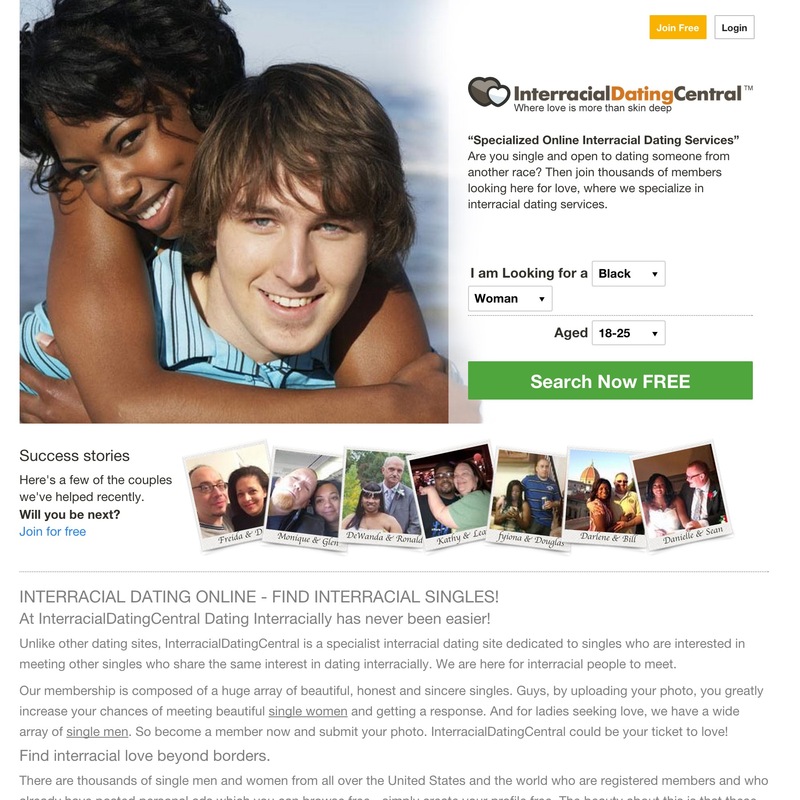 It is dedicated to singles that are interested in interracial dating, with a wide range of single women and men looking for love, romance, friendship and even marriage. The site has many members from everywhere in the US as well as from all over the world. The site has been successful in making matches between the US and Canada, the UK and Germany, Australia, Sweden and many other countries. It has also been effective in bringing together people of different religions, such as Christians, Jews, Muslims and Catholics, to name a few. You can make a quick search from the Home page by entering your details and the type of person you are looking for, such as Black, White, Asian, Latino or simply ‘Any’ and you can start browsing through the hundreds of profiles on the site. Joining the site is free and free members can view unlimited number of profiles. They can also read as well as reply to the emails received from other members. In addition, they can view the members who are flirting with them. To become a member, you have to fill in details regarding your gender and the kind of person you are looking for whether you are seeking a short term or a long term relationship, penpals, friends and so on. You must also specify your ethnicity before you can register at the site. You can then add photos, and flirt or reply to other messages from members for free. If you are interested in additional options for contacting other members and enjoying the enhanced features of the site, you can get a VIP account. With the VIP membership, you can start chatting with other members, receive unlimited messages, use a webcam for video chatting and check out who has been seeing your profile. The price for a six-month subscription is quite reasonable, but it can be more expensive when you opt for a monthly subscription. The cost is $11.63 a month for a six-month contract, $13.17 per month for three-month contract and $19.95 a month for monthly subscription. The site shows the photos of the latest members for open and quick viewing. You can also view the photos of the couples and members that have found success on the site, on the home page itself. There is a quick link available for the chat room from the Home page. By clicking on this, you will be taken straight to the chat room. Here, you can find the number of members online at the time and just have to press on the Start Chat button. There are also many photos available of the members who are regulars in the chat rooms and click on these for starting a chat. You can type out your messages and also have a video chat with potential dates. What’s more, you can also chat with several people simultaneously, merely by creating docks. It is also possible to create your special room where you only let those members whom you want inside. If you find that some member is offensive, you can block them. Otherwise, you can also request the Room Administrator, so that the person can be KICKed out of the room. Alternatively, you can leave the room and go to another room with your friends. All profiles offer the option of blocking a particular member. The blocked member will not be able to visit you or to contact you. In addition, you are also allowed to report an abuse by a member by clicking on the Report concern found on the profile of the member. A free membership only allows you access to very few features and you have to upgrade to the VIP membership to get access to others. You can create your own blog and read the articles written by other members as well. The blog page is well categorized into Advice, Coaching, Opinion, Inspiration and Date Whisperer. For instance the Coaching section has articles and tips that can help you in creating an effective profile, assisted by their dating coach. It will also help you choose the correct photo, what you should include in your profile, and other tips for finding more members. Members can also chat with experts on a live basis. You can avail a personal review for your photographs and a free transcript of the coaching session in your email. The Opinion section is also very interesting, where you can post your opinions general controversies and other topics related to interracial dating. Carson Simons, a very popular expert, offers you guidance with videos to make the maximum of your online dating experience at the site. The site offers good communication features, through live chat, email and fax and has blogs and good articles for reading. We also found plenty of active members on the site; so it is worthwhile joining the site for an extended period of time with a VIP membership.